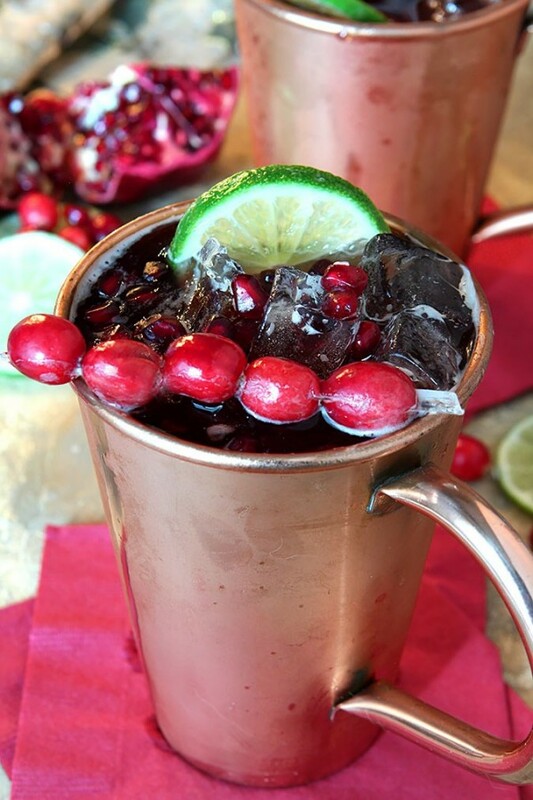 The perfect seasonal beverage, this Cranberry Pomegranate Moscow Mule has holiday colors and flavors and the special zing of ginger beer! During the summer my favorite cocktail is always a margarita and I love trying out different versions with every available fruit under the sun. Once cold weather hits I gravitate from the margs to other cocktails and the Moscow Mule is one of them. I’m not sure why; it’s still a cold beverage but I’m thinking it might be the ginger beer; it has some oomph to it that I love. I’ve not experimented as much with Moscow Mules but I’m working it and this Cranberry Pomegranate Moscow Mule Cocktail was a worthy journey. Fresh flavor for the holidays and that delightful zing from ginger beer. It’s a winner! That I did not deliver on time for Friday Cocktails has become a bit too much the norm but I’m not quite ready to give into Saturday Sips. It’s just Friday Cocktails Belated, right? But I do have my tree up and most of my house decorated and a Dickens Christmas Village that I collected when my kids were little all setup with a train station, a brick road, houses, and a skating rink…promise no slacking going on here! Last summer I was introduced to Deep Eddy’s Lemon Flavored Vodka. This isn’t a whisper of lemon; it’s a decidedly lemon flavored vodka and I loved it. Not only that, it was pronounced enough that combining it with a splash of soda and a slice of lemon resulted in the perfect quick summertime beverage. So when I heard they had a Cranberry version I was excited to try it out. I love those little berries and their seasonal availability makes them that much more precious. I’ve been wanting to make a holiday Moscow Mule and this was the perfect opportunity. I decided that a combination of pomegranate juice and cranberry vodka might be just the ticket and it was perfect. If you’ve never had a Moscow Mule you really need to change that; the vodka and fruit with lime and ginger beer is outstanding and as fun to make seasonal as my beloved margaritas. 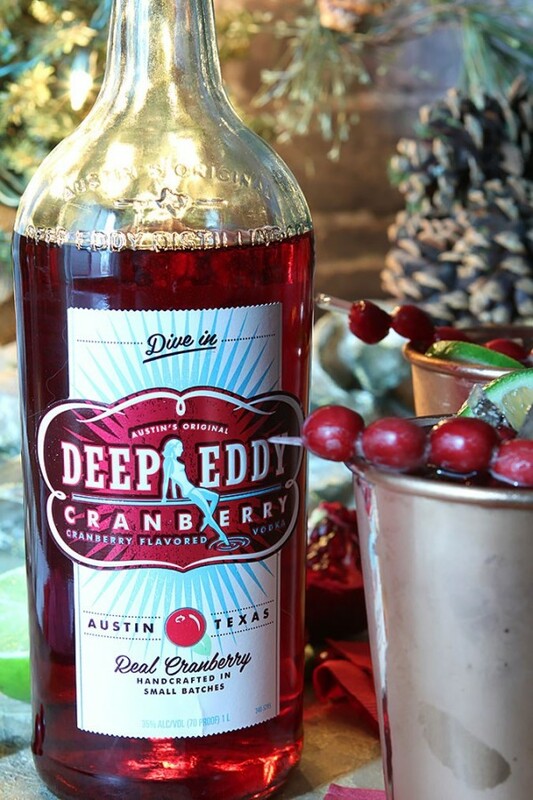 Deep Eddy Cranberry Flavored Vodka is handcrafted in their Texas distillery from real New England cranberries and their award-winning vodka to deliver a light taste. We loved it in this cocktail but much like the Lemon you can easily enjoy it mixed with club soda & a splash of lime or even in your favorite Cosmo cocktail. I have to tell you, I’ve loved both of them and now have a couple of others in my sight…Ruby Red Grapefruit Vodka? Yes please! Take a peek to see where they’re located near you and get thyself a bottle stat! Out of curiosity, I did wonder if I had ever made a Cranberry Margarita. I’ve done a Pomegranate Margarita but no cranberry. Who thinks that needs to change? (Barb over here waving my hand frantically!!) That will happen! Fill a cocktail shaker with ice. Pour in the vodka, pomegranate juice, and lime juice and shake vigorously until ice cold. Add ice to two copper mugs. Pour mixture into 2 mugs then top with ginger beer and stir. Garnish with a combination of cranberries, pomegranate arils and/or lime slices. If not using Deep Eddy's Cranberry Vodka, substitute 3 ounces of your favorite vodka and add 1 ounce of cranberry juice. 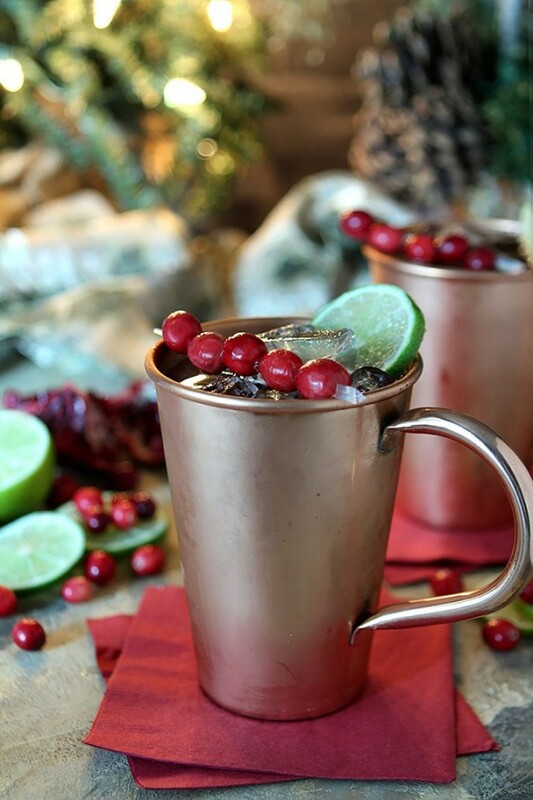 The post Cranberry Pomegranate Moscow Mule Cocktail appeared first on Creative Culinary.